The room is dim. Four musicians tinker with their instruments as a fifth, the front man, walks onstage. A slight but noticeable crescendo accompanies his entrance. He is tall with a strong build. A large paper mache head rests on his broad shoulders, covering his face and giving him a nondescript expression. This is Frank. Frank feels for a cable around the microphone stand and connects it to the head. As he begins a cult-like incantation over the increasingly chaotic froth of sound, we can’t help but expect something to happen befitting his strange appearance. But at the moment we think the scene will meet our anticipation, the sound system overloads and sparks fly out from the amplifiers. This moment sums up Frank. At times it feels like it should be sweeping in scope, but ultimately the film exists on a far smaller and more intimate scale. Its narrative meanders and its off-center nature is often darkly hilarious. Director Lenny Abrahamson and co-writers Jon Ronson and Peter Straughan play with a frenetic emotional spectrum, sometimes jumping sharply between bleak and bright beats. That fake head’s appearance remains unchanged throughout the film. Underneath, Michael Fassbender is left with only his shoulders to express himself. The slightest slump reveals a devastating shift in feeling. He sinks deep into Frank’s elusive demons and adds an affecting duality to the mysterious character. His deadpan earnestness is wonderfully ridiculous and strangely engaging. By cinematic happenstance, Jon meets Don (Scoot McNairy), the manager of a little-known band with the barely-pronounceable name “Soronprfbs.” After their keyboard player’s suicide attempt, the band looks for someone to replace him. Jon rapidly accepts. 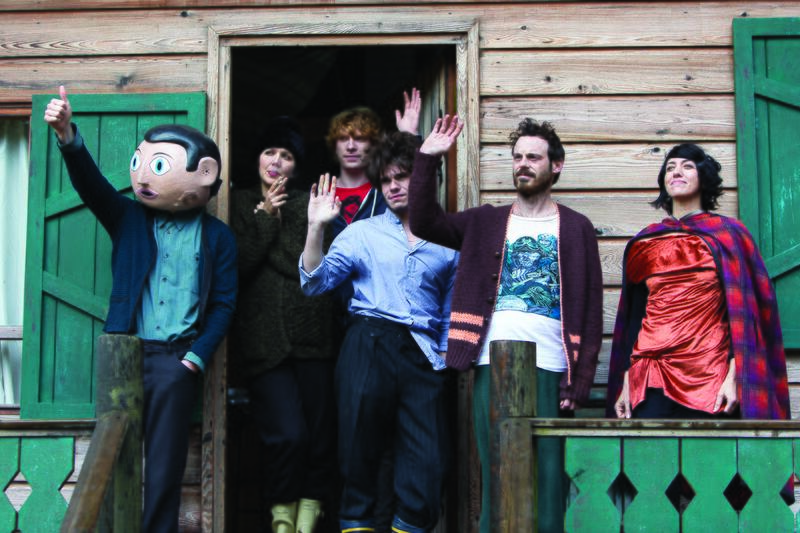 They go to a secluded cabin in the woods where they spend nearly a year recording the band’s ostensible masterpiece. Jon schemes to make it their big break. The increasingly ridiculous hashtags he affixes to tweets about the band’s progress are a welcome humorous spice. Frank moves meditatively through its 95 minutes. Abrahamson understandably spends most of his time, and ours, focusing on the titular character’s eccentric creative process. 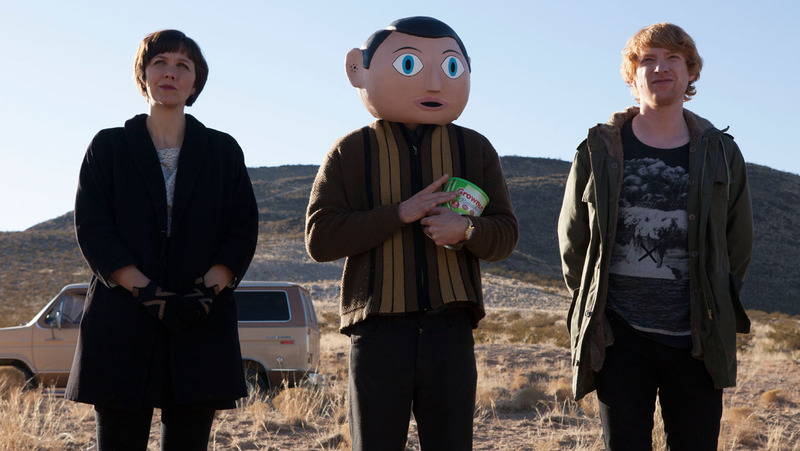 The role requires much of Michael Fassbender, whose recognizable face is covered for nearly the entirety of the film, leaving Frank to start literally describing his hidden facial expressions. When we finally do see beneath the giant paper mache head, the effect is neither shocking nor comforting. The transition is seamless thanks to Fassbender’s commendable consistency. He carries Frank’s enigmatic persona with physicality, expertly conveying emotion through the slightest changes in body language. Gleeson is equally compelling in his perhaps too-familiar role as a fame-hungry everyman, but it’s Maggie Gyllenhaal who cuts deepest. As Clara, the band’s foul-mouthed synth and theremin player, she easily owns all of her scenes. Her acting is fittingly subtle for a character who obsessively controls nearly everyone around her. Her absolute commitment to getting what she wants manifests in the film’s funniest and most surprising scene. But for its ending, which all too dismissively sweeps an important issue of mental illness under the rug, Frank offers an affecting window into the artistic mind. The denouement fails to fully acknowledge this serious undercurrent running throughout, and in so shrugging loses some of its heft. That lapse isn’t enough to offset the film’s unique charm. Frank drops a few threads too abruptly, but like any good performer, it left me wanting more. This article was published in its original form in The Massachusetts Daily Collegian on September 11, 2014.